After Cuba, Bolivia's new Socialist President, Evo Morales, made a visit to China in early January as part of a "grand tour" drumming up support for his new regime. According to Prensa Latina, Morales met Chinese President, Hu Jintao in Beijing on January the 9th. President-elect of Bolivia Evo Morales expressed Monday satisfaction in China, after holding talks with President Hu Jintao at the Great People´s Palace, with which he put an end to his China visit. His visit to Beijing shortly after his election shows his friendship for China and his willingness to strengthen bilateral relations, said Hu for his part. Morales thanked the Chinese head of state for the invitation and called China a political and ideological ally for his country. According to diplomatic sources, the Bolivian president-elect´s visit opens new prospects of development and cooperation between the two countries in the political, economic and trade fields. Morales also met with current State counselor Tang Jiaxuan and chief of the Chinese Communist Party Central Committee´s International Department, Wang Jiarui. Morales´ aide Carlos Villegas told journalists of the need to broaden and strengthen links between the two nations in investments, trade and bilateral cooperation. Bolivia's president elect invited energy-hungry China on Sunday to help develop his country's vast gas reserves after his government carries out plans to nationalize them. Evo Morales' visit to China comes amid a campaign by Beijing to develop ties with nations throughout Latin America as new sources of fuel, raw materials and new markets for its export dynamo. 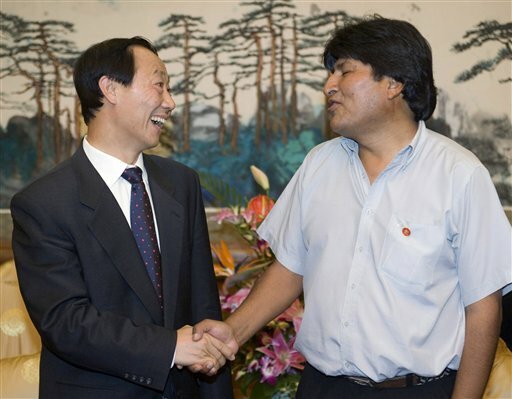 Morales... said he hoped to build ties between Bolivia's socialist movement and China's ruling Communist Party. China, as part of its push for links to Latin America, has signed deals to develop Venezuelan oil fields, and its investments in the region include a Brazilian steel mill and copper mines in Chile and Peru. For their part, Brazil, Argentina and other nations look to China as a source of investment and markets for their own exports. Beijing has become a regular stop for Latin American leaders traveling with large business delegations.